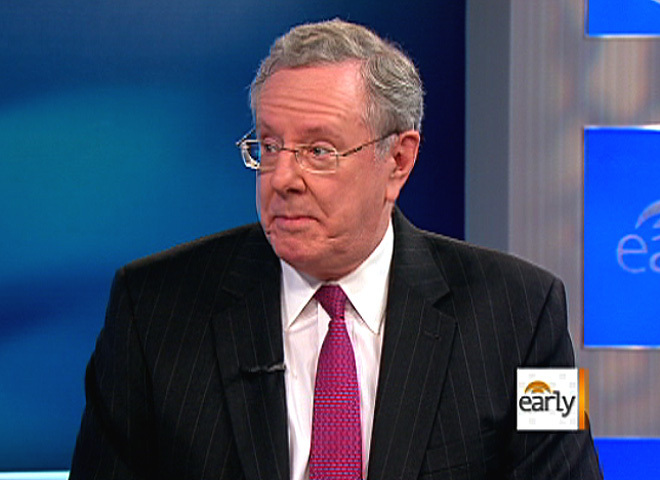 Steve Forbes, the chairman and editor in chief of Forbes Media and former Republican presidential candidate, dismissed President Obama's call for raising taxes on the wealthiest Americans - the plan dubbed the "Buffett tax," after billionaire Warren Buffett, who has suggested the rich don't deserve to pay lower tax rates than their employees. "Well, if Warren Buffett wants to pay the same tax as the people who work for him, then he should pay himself the same net salary that people who work for him [get]," Forbes said on CBS' "The Early Show." Buffett had written in a recent New York Times op-ed titled "Stop Coddling the Super-Rich," that he and others among the 0.3 percent wealthiest Americans pay substantially lower tax rates than other Americans, thanks to tax laws and loopholes written by Congress. Buffett noted that his federal taxes last year amounted to 17.4 percent of his taxable income - a lower rate than that paid by any of his employees, whose tax rates ranged from 33 to 41 percent . Forbes said the current tax code simply recognizes the risk investors take, and warned that raising rates on capital gains would "punish" the wealthy. "Most of [Buffett's] income apparently comes from dividends and from capital gains. And if you raise the tax on capital gains and dividends, you're going to get less capital creation. We tried this in the 1970s. It led to a disastrous decade - one of the contributors to that," Forbes said. "So instead of trying to punish people, why not try to create an environment the way Reagan did and ultimately Bill Clinton did, of having people put risk capital to work and create jobs? "[Obama] is trying to say the rich are the problem - 'If we get rid of the rich and tax them more, everything will be well.' I think the American people know that's not going to work," Forbes said. Referencing Buffett's call on behalf of billionaires, anchor Chris Wragge asked Forbes about the Treasury Department's program - Gifts to the U.S. - in which taxpayers can write a check to the government to help reduce the national debt. "Would you prefer him writing a check rather than bringing you all into the fold?" Wragge asked. "Well, I pay a lot of tax because I get a lot of earned income," Forbes said. "And if he wants to do extra, yes." He suggested Buffett could go the Treasury website and get the address "to send in his extra billions. "But so far, he hasn't done it yet!" Anchor Erica Hill asked about Forbes' advocacy for a flat tax. "Let's make it very clear:" said Forbes. "If you earn income, you pay a 35 percent, 40 percent rate. If you get a capital gain, you get the 15percent rate. There is always the net differential because capital does not always get a return. We've learned that from the stock market in the last three years. It's putting money - getting a real risk." "When it does get a return, you don't pay taxes on it?" asked Hill. "No, you DO pay a tax on it! But the fact of the matter is, if you punish people who take risks - remember, most new ventures lose money. And if you get a hit, the government's going to take it away from you. People are going to do what they did in the '70s, and say, 'We're not going to put it at risk.'" Forbes suggested that, instead of raising rates for certain brackets, the government should introduced a single low rate, and get rid of all deductions. "Have generous exemptions for adults and for children so a family of four pays no federal income tax on their first $46,000 of income and only 17 percent above that - truly simplify the code," he said. Foreseeing another "rancorous debate in Washington" over such a plan, anchor Chris Wragge asked Forbes if he believes simplifying the tax code can happen. "Yes, after 2012. I think there'll be a mandate for it. Even the president is making noises about it, so the public is shifting in the right direction."